April 3 meeting at 7:00 pm, held at the JFK Aircraft Carrier Project Office (map). March 6 meeting at 7:00 pm, held at the JFK Aircraft Carrier Project Office (map). Meeting at 7:00 pm, held at the JFK Aircraft Carrier Project Office (map). 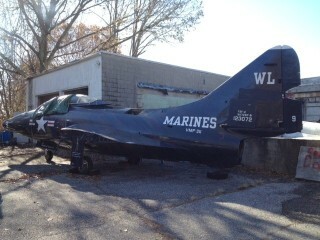 The F-9 Panther jet that you might have seen at parades around the state is at the JFK Aircraft Carrier Project Office for some work. The tail section is now inside the garage and the rest will follow. Over the next few months we will be fabricating a tail horizontal stabilizer and fixing the nose wheel support structure, so this is an opportunity to learn or teach something. 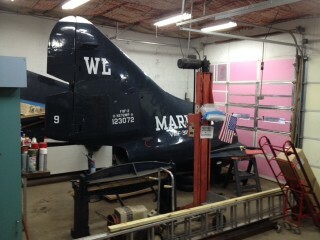 Design work/planning, sheet metal and welding will be utilized … and of course painting. June 6 meeting at 7:00 pm, held at the JFK Aircraft Carrier Project Office (map). April 4 meeting at 7:00 pm, held at the JFK Aircraft Carrier Project Office (map) and not at the Quonset Air Museum. Hands-welding of 4130 steel tubes … just like those used in tube and fabric aircraft. People can try out the welding for themselves. February 7 meeting at 7:00 pm, held at the JFK Aircraft Carrier Project Office (map) and not at the Quonset Air Museum. Members and public are welcome for a free meeting with a movie being shown (7 pm). If you’re interested in aviation or building aircraft, feel free to check out a meeting. Location is the JFK Project office. 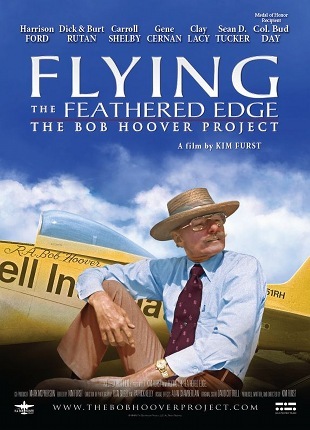 Flying the Feathered Edge: Bob Hoover Project – aviation story of legendary pilot Bob Hoover. We’ll have popcorn, Munchkins, coffee, and other drinks.